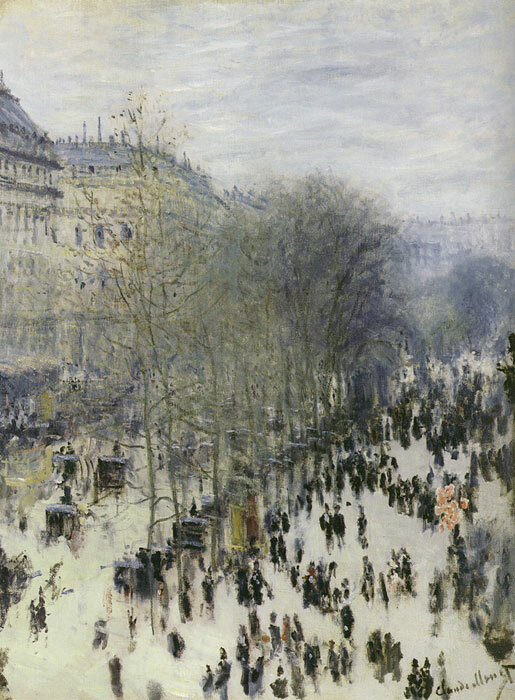 Let's compare Monet's "Boulevard des Capucines" (1873), a classic Impressionist work, to one of the 1903 water-lily paintings. The 1873 painting depicts a street scene from above. Men leaning over a balcony in the right-hand side of the painting have roughly the same view of the scene as we do. In this work, Monet packed the information of a transitory moment into the frame. The painting also depicts a specific place. The water lilies, on the other hand, offer no such set of geographical coordinates; they are more dreamlike -- less reflective of a specific place and point of view. Indeed, it is doubtful that Monet was checking his motifs very often while engaged in some of his later paintings at Giverny. SPECIAL NOTE : The painter will make the reproduction as close to the original oil painting as possible. If you want your painting to alter from this likeness, please email us and " Boulevard des Capucines, 1873 " will be reproduced according to your special requirements.